When I was knee-high to the cattle roaming near my Midwestern home, my grandfather gave me a block of old barn wood for my birthday. Burned into it was that famous Helen Keller quote, “Life is either a daring adventure, or nothing.” My grandfather knew a thing or two about growing things in the dirt, and about his precocious granddaughter. Later, in a relatively abbreviated period of time, I went from a deliciously luxurious life spent marinating in grand adventures, near and far, to the sometimes austere and certainly crazed life of a single mama running her own business and running after a tiny human. Where do great adventures factor in? Do I still take that Chamonix ski trip, but this time pack in my kiddo instead of my ice tools? Do I throw caution to the Montana wind and buy a ticket to New Zealand? Or do I now buy two tickets and download 20 hours of cartoons to the iPad for the flight? And do I realize a lifelong dream of learning how to sail, press pause on my Montana life and allow the winds to carry me around the globe…albeit this time with a tiny-human sized life jacket aboard? The answer is simple. Yes, yes and YES! I’ve made many mistakes at this parenting game that I've tackled on my own. Now, to a nearly 3 year old the term ‘adventure’ means a slew of different things. We often load up on crusty bread and ‘adventure’ on our bikes to the MSU duck pond and share carbs with our webbed friends. We also ‘adventure’ to nearby Yellowstone National Park for geyser gallivanting, to practice our elk calls and then spend the evening bouldering on grassy slopes high above Gardiner with Electric Peak on the horizon. And most recently, ‘adventuring’ has included Kaia’s inflatable dragon floatie that we’ve launched for many aquatic missions across Montana’s rivers and lakes (Lake Upsata is a recent favorite…full of lily blossoms, loons and trumpeter swans!). As my daughter grows older, she continues to astound me with her simple wisdom. She is correct in that ‘adventuring’ does not always have to include lengthy plane rides, schlepping gear up a far-flung mountain or river, and scaring myself silly in general. All of that is good in moderation, but what we are so lucky to enjoy in Montana is the spectrum of adventure. From meandering ambles scouting for bear grass on the Whitefish Trail in northwestern Montana, to leisurely canoe paddles in the stunning Missouri River breaks, to dawn patrol backcountry ski days filled with homemade muffins and fresh powder tele turns in Hyalite just south of Bozeman…we can fill our boots with adventure in any fashion we choose. All we have to do is walk out our front door. 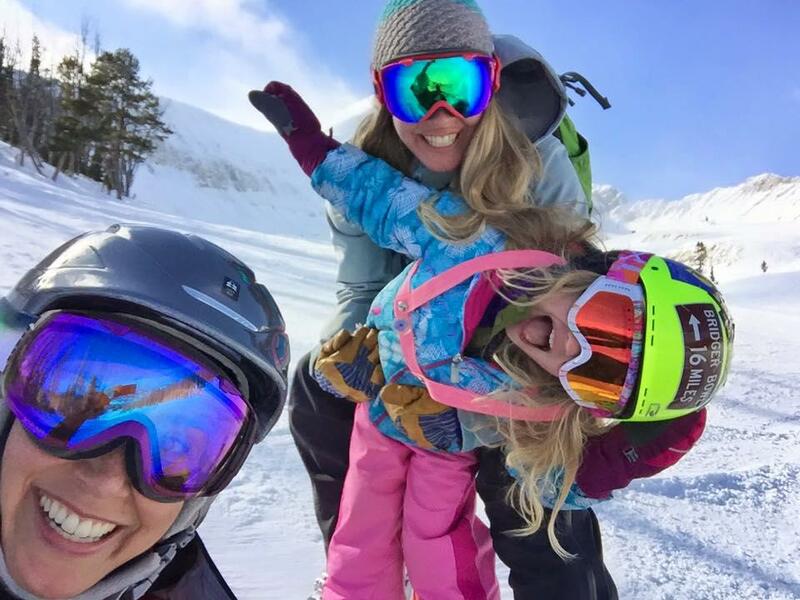 Becky Edwards is a runner, climber, skier and all around mountain lover who resides in the shadows of the Bridger Range with her daughter, Kaia, two furry wolf pups and a cat named Pickles. She owns a communications and marketing consulting company: Sun Snow Creative.